My oh my it’s hard to believe that Thanksgiving will be here in less than a week! We wanted to provide a few tips that will help you stay on track with your health goals during this week of feasting! I have to admit that a well prepared Thanksgiving meal is one of my favorite indulgences and the memories and laughter that it conjures up makes me smile around this time every year. With that said I am a huge fan of all the holiday “trimmings” and do find it hard not to over-indulge on mashed potatoes and gravy, dark meat turkey and stuffing. Given that the average Thanksgiving day meal has over 3,000 calories (more than most of us consume in a day) here are some tips that will help you get through the holiday shuffle without feeling deprived and leaving you with less work to do on your body on January 1st! Keep a visual… on your plate: When you place food on your plate you should be able to see part of the pattern and/or some “white space”. I don’t know what it is about family style meals that turn us into hoarders who construct food piles on our plates. Most of us are able to go back and get a second helping if we choose. Lighten up: Although there is usually a family fight as to the two drumsticks, leave the fighting to others. White meat has less than half the calories – and a quarter of the fat – of dark meat with skin. Think outside the turkey: Cook stuffing outside the bird so it doesn’t absorb the fat drippings. This will also help avoid “soggy” stuffing. The calories and fat saved here will allow us to indulge later on a small slice of pumpkin pie! Avoid the egg nog: One cup of this traditional holiday beverage contains over 450 calories! Of course that’s if you just have one cup. Skip the egg nog and enjoy a glass of wine which only has 125 calories per 5 oz. serving. Socialize: The more focused you are on talking, playing football with the kids or walking with family the less you are focused on food. Just remember that Thanksgiving festivities can last a few days. We can all enjoy the event but let’s not take it to the extremes. All of our bodies can recover from a day of indulgence, it’s the multiple days in a row or worse yet a whole month of parties, rich foods and treats that can hit us with the holiday bulge. Enjoy your Thanksgiving week with family and friends! We hope you all had and awesome week and have fun activities planned for the weekend. With the cooler weather upon us it’s a reminder that the holiday season is just around the corner. For those of us that are on a diet or are trying to prevent the “holiday bulge” it can be a challenge. Over the next few weeks we will be bringing you healthy and tasty recipes to help you stay track, appetizer ideas and advice on how to handle social temptations that might sabotage your efforts. 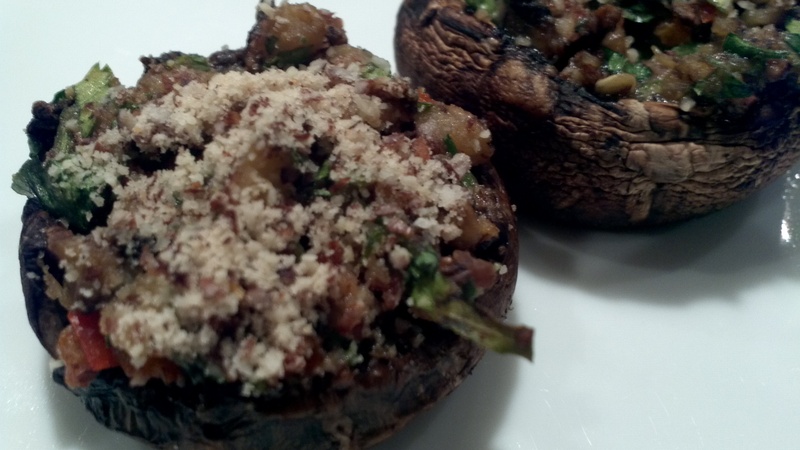 One great appetizer idea that gets the green light is our Vegan Stuffed Mushroom recipe. These mushrooms are acceptable to the vegan (no cheese), gluten-free, sugar-free, dairy-free and low-carb crowd. Did we mention that these can be made ahead and then heated through just before serving? Here you go! Preheat oven to 375 degrees. Line a baking sheet with foil and lightly spray or wipe with olive oil. Pull the stems off the mushrooms and roughly chop. Brush the mushrooms caps with the olive oil. Mix the chopped stems with the parsley and garlic. Season with salt and pepper. Heat a fry pan over medium high heat. Add the rest of the olive oil. Put in the eggplant and red pepper. Sauté until golden. Toss in 2 Tablespoons of the parmesan cheese or almond meal and incorporate. Remove from the fry pan with and mix with the stem mixture. Spoon mixture into each mushroom cap. Place the filled mushroom caps onto the oiled baking sheet. Sprinkle the reserved parmesan cheese or almond meal over the top of the mushroom and bake in the oven until cooked, about 15 minutes. There you have it! A delicious party appetizer that can be made ahead of time and served either hot or at room temperature.